I’ve transplanted a river valley from the adjacent Port Dover branch onto my layout, between St. Williams and Port Rowan. Here’s why and how I’m modelling the Lynn River. Over the past few weeks I’ve been pushing myself to get the trees done in the Lynn Valley. I’m almost done with building the trees – almost. I’m guessing that I have another half-dozen trees to do, each about eight inches tall. They’ll go in to the scene along the fascia near the water tank. I lost count, but I’m confident that this area has more than 100 trees built from individually twisted wire armatures. It sure has changed the look of this portion of the layout. I still have some detailing to do. For example, there are spots in the foreground where I’ll insert deadfall, saplings, and ferns and other forest floor plants under the trees. And I want to do another weeping willow to the right of the river in the above photo. 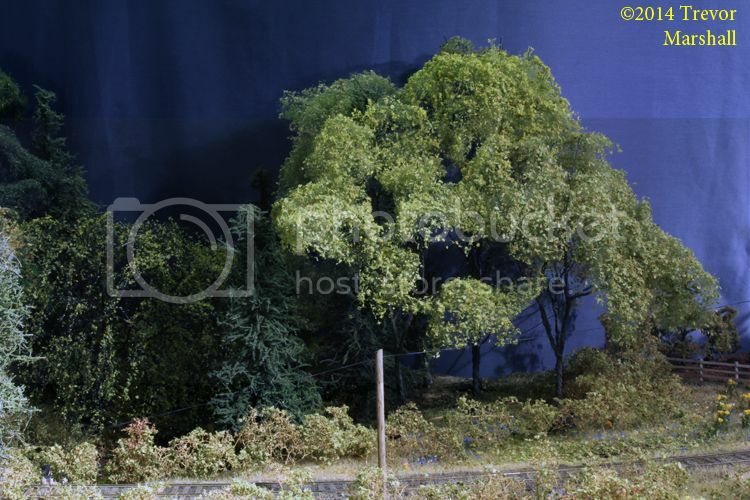 Then there’s the rest of the layout: I estimate I’ll need another 50 trees for St. Williams and Port Rowan. But I can see the light at the end of this Green Tunnel – and yes, it’s a headlight! I’ve been working at the west end of the Lynn Valley – adding more trees and adding canopy to some bare tree armatures that have been in place for a while. In all, I’ve finished more than a dozen new trees for this area. It’s making a big difference. 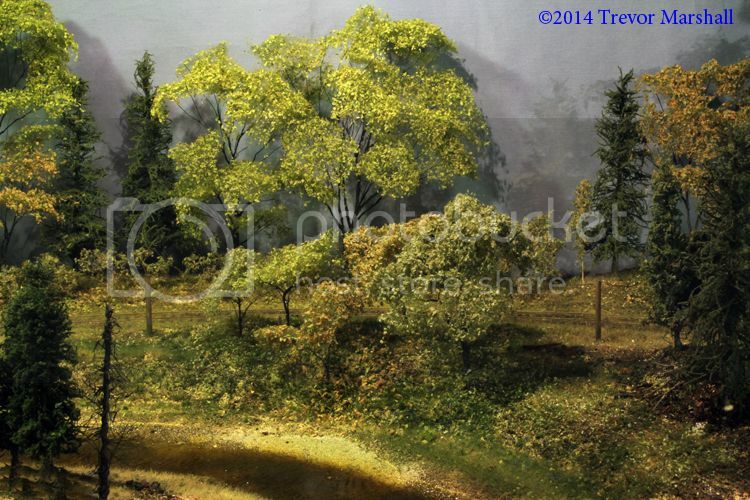 … although more trees are needed in the foreground here, too. As noted, I need more trees – particularly in the foreground. I’ll add those as fast as I can twist armatures, add bark texture and create canopies. 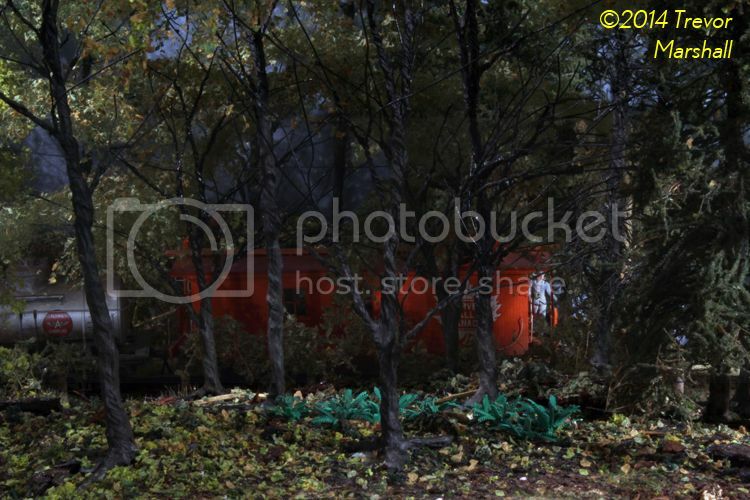 As anybody who has planted trees on a layout can tell you, layouts eat trees at a frightening rate. 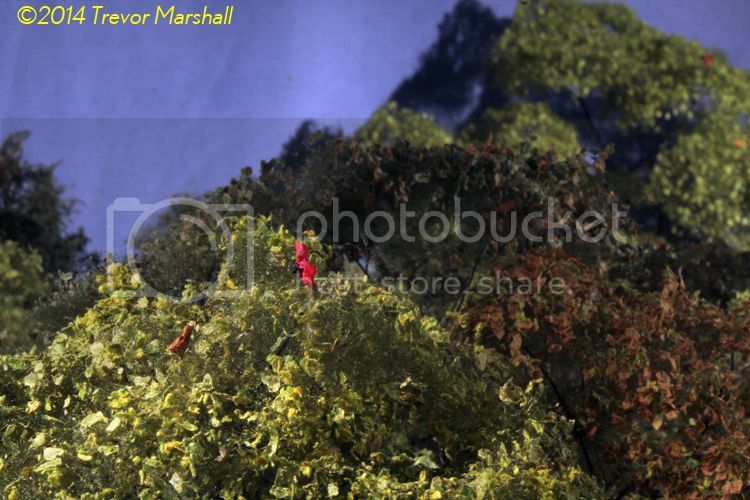 There are approximately 50 trees in the above image – most of them scratch-built by me, using my variation on the techniques I learned from the Gordon Gravett tree books. And yet I’m only about halfway through adding trees to the Lynn Valley area. I’ve basically done the trestle scene on the Lynn River. That said, I think trees are important and must be convincing on a layout so I’m very pleased with the progress on this scene. For the longest time, the “grass and occasional evergreen” in this area made it look more like something in the western mountains. The addition of so many deciduous trees to this area conveys the desired feel of Southern Ontario. 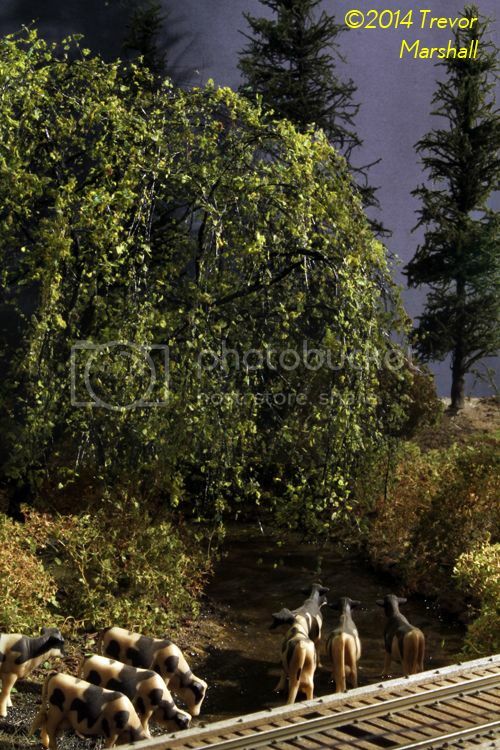 What’s more, their height and placement – including trees between viewer and train – help disguise the fact that I was forced to use a fairly tight radius through the valley. Still to come: more trees – a lot more trees – to the right of this scene as I head towards the water tank and Port Rowan. And I see a few spots in this area where I can add some bushes. But for now, I’m enjoying this transformation on the layout. More words in the fullness. But I’ve burned through a Wallin-sized bottle of extra-hold hair lacquer and despite running the paint booth while doing this, the stuff has given me a headache. Plus – every time I shake my head, Selkirk Leaves fall out of my hair. I’m waiting for some detail parts to arrive for my tobacco kilns, so I’ve set them aside for now. Instead, I’ve been working at the other end of St. Williams – the west end where (on my layout, at least) the line passes over Stone Church Road then plunges into the Lynn Valley en route to Port Rowan. With time on my hands this weekend I pulled the wire tree armatures from this area and turned them into finished trees, following my usual take on the Gordon Gravett method. Much, much better, I think. I did not bother adding the white boards at the other end of the fence as it’s out of sight – and I’m not going to add fences between here and Port Rowan because I feel they’ll clutter the scene unnecessarily. This newly scenicked area will give visitors a better idea of my plans for the rest of the Lynn Valley. That said, I planted about 20 trees here over the weekend and based on that I expect I’ll have to build another 80-90 trees to complete the valley scene. Fortunately, the armatures – which take the longest – can be twisted while watching TV, minding a pot of stew in the kitchen, etc., so it shouldn’t take that long. Besides – I’m inspired now, and keen to see the completed valley! 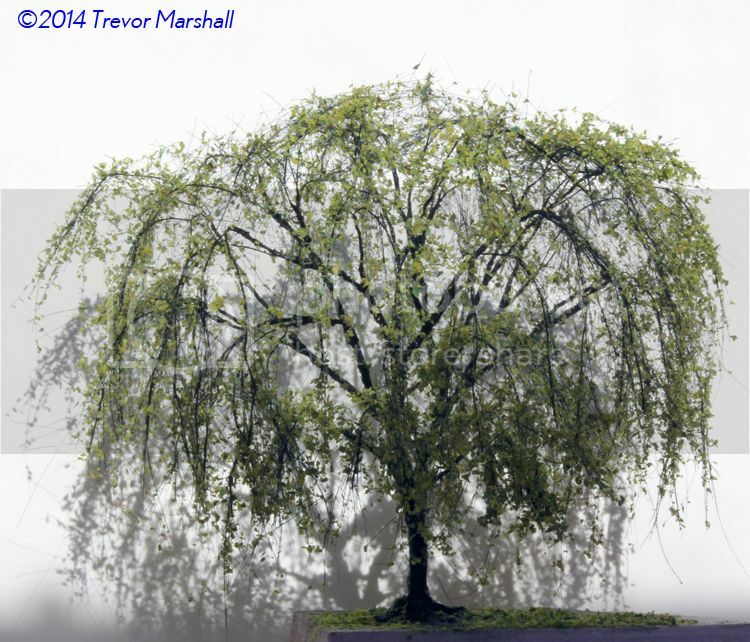 I built this weeping willow yesterday, using techniques from the excellent Modelling Trees – Volume 1 by Gordon Gravett. I crafted a wire armature then filled out the branches with strands cut from a cheap “Elvira / Morticia Addams” style wig purchased last Hallowe’en, knowing that eventually I would put it to good use. The leaves are by The Selkirk Leaf Company. The tree took about 2-3 hours to make, plus drying time. I’m pleased with the effect – and with how this scene is coming together. There are a lot more trees to build, but I have several armatures twisted and ready to coat. Fortunately, my general forest tree doesn’t take nearly as long as a willow! I followed techniques described by Gordon Gravett in the third volume of his excellent scenery books. I haven’t had much time to work on the layout this month but over the weekend, I made some time – just enough to get started on planting cattails along the banks of the Lynn River. I’ll use the remaining four packages to add some cattails near the twin-span steel girder bridge, then decide if I need to buy more. Each grouping of cattails is located on the inside of a curve in the river, where the water is a little slower: I avoided outside curves since water tends to erode riverbanks in these locations. The water flows left to right in these photos, so at the sharp curve near the trestle I located the planting after the curve, in the lee of the flow. To plant the cattails, I drilled holes in the scenery base using a Dremel tool, dipped the end of each plant into a blob of Weld-Bond, and stuck them into the holes: easy-peasy. The Magic Water I used for the river drills extremely easily. But the sand I used as part of my ground cover does a great job of ruining drill bits – it’ll take the point off a bit in no time, and I wrecked two bits while planting six packages worth of cattails. The lesson: Use cheap bits in readily available sizes. 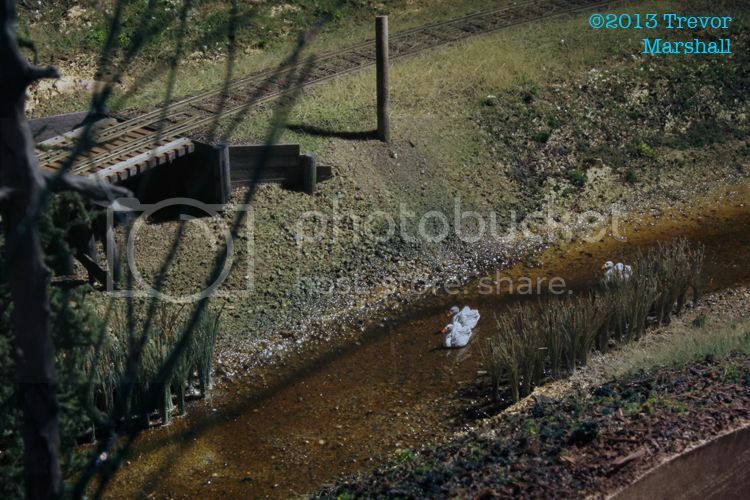 Keep in mind that this is early days – I have a lot more vegetation to add along the banks of the Lynn River, especially in this stretch that flows under the trestle. I will need to create many, many bushes and small trees to line the banks – but these bulrushes will add a different texture to the scene. I think it looks better already! 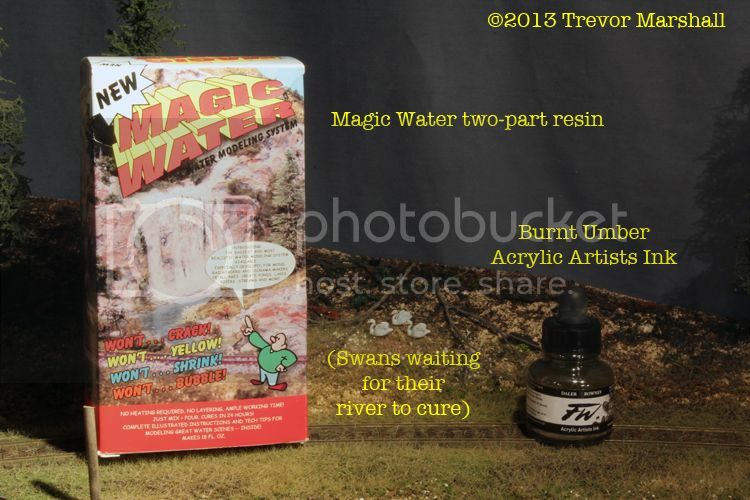 The Magic Water two-part resin has cured and I’ve been able to restore the swans to their proper place in the Lynn River. 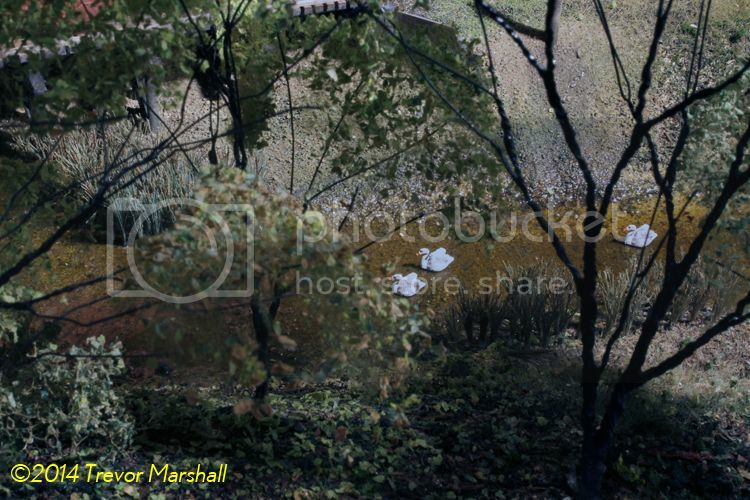 I like the reflection of the swans in the water. To keep the water surface nice and shiny, I will have to remember that the vendor, Unreal Details, recommends cleaning with an “anti-static plastic cleaner”, which can be found at a hardware store near the plexiglass. I’ve always been hesitant when modelling water. I’ve tried several systems that have failed me for various reasons. 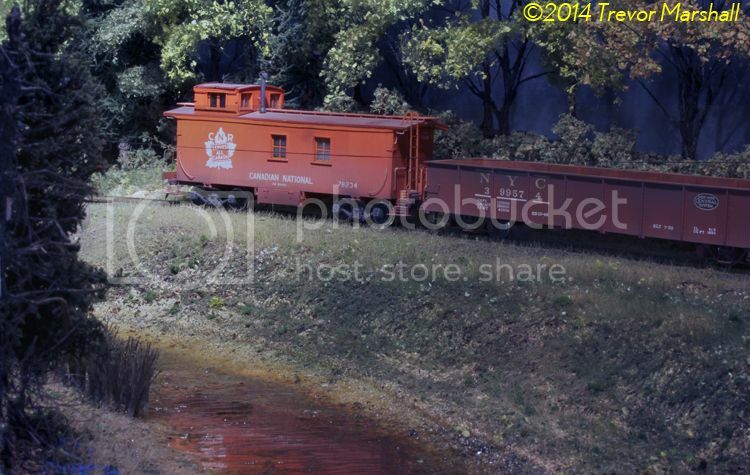 But last night I decided it was time to Man Up and pour the two sections of the Lynn River depicted on my layout. 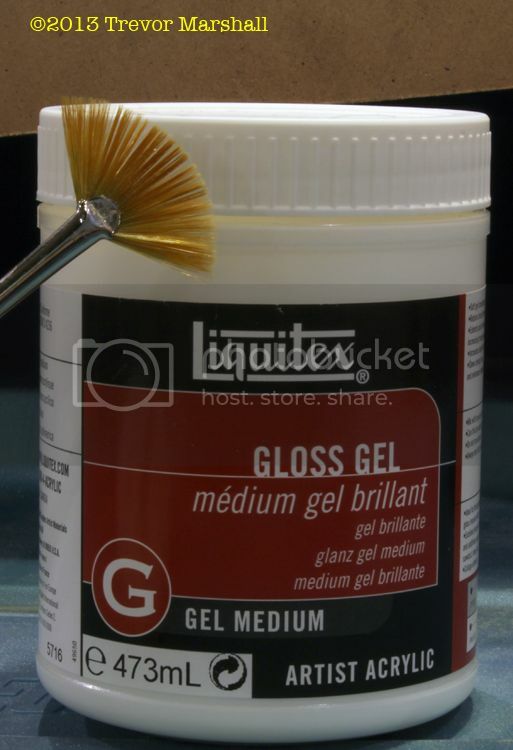 I mixed the resin and hardener in several small batches, adding a few drops of Burnt Umber acrylic artists ink from Daler-Rowney to each batch prior to mixing. As the Magic Water instructions say, mix well: I set a timer on my phone and kept stirring until the alarm went off, to ensure I didn’t shortchange this part of the process. – I made sure the riverbed was as level as I could make it – not only front to back, but also side to side. 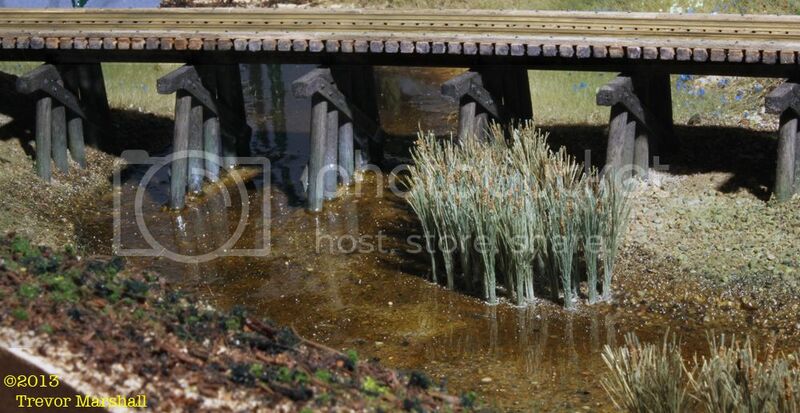 – For each section of riverbed, I used a single (un-spliced) piece of 3/4″ plywood as the base. – I made sure there was plenty of plywood to either side of the actual, modelled piece of river. This gave me ample space to which to attach the foam board that I used to create the riverbanks. 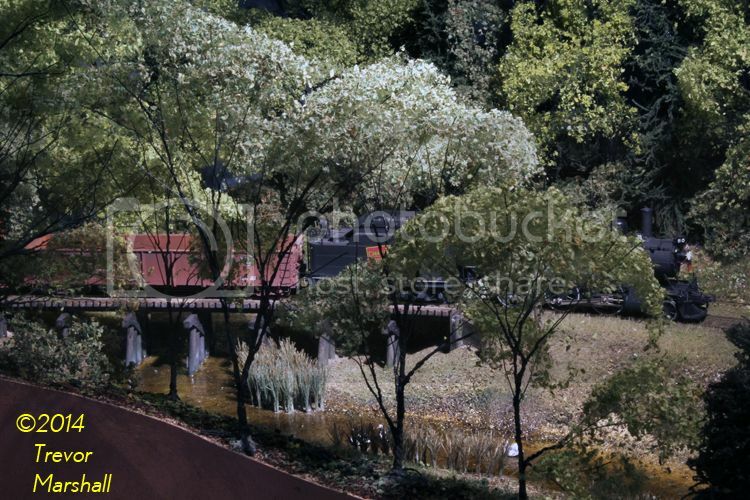 – When the riverbanks were installed, I coated everything with a couple of layers of hydrocal. – When adding scenery to the riverbanks, and detailing the river bottom, I used generous amounts of thinned Weld-Bond to make sure everything was solidly glued in place. The Weld-Bond also sealed the plaster and any holes I may have missed. I obviously did a good job on my preparations, because the Magic Water stayed on the layout. When I checked this morning, the floor was resin-free under both sections of the river. Phew! There’s very little wicking, although when the resin has cured I will have to add some bushes along the shoreline in a few places where the resin did wick into the adjacent scenery. I’m especially pleased with the brown tint. I think the ink was a good choice. And I like the reflections I’m getting off the river. The truly magic part? I had just enough material in one package of Magic Water to do both sections of the river. It couldn’t have worked out better if I’d planned it! Achievable Layouts I’ve had a life-long interest in layout design. Some of my thoughts on the subject can be found here. Adventures in Live Steam My blog about my interest in garden-scale live steam. Niagara Electrics in 1:64 Modelling the Niagara St. Catharines and Toronto Railway in S scale. S Scale Workshop I’m a member of this group of friends that has built an S scale exhibition layout to Free-mo standards. The Model Railway Show The podcast I produced and co-hosted with Jim Martin. Currently on hiatus – but you can still listen to all of the shows we did. "CN Lines" The magazine of the CNR Historical Association. A terrific resource. "Hamilton's Other Railway" This book, by Charles Cooper, is one of my prime sources of information about the line I model. Highly recommended. "Mainline Modeler" This was a superb modelling magazine – and the complete collection (all 304 issues) is available as PDFs on DVD from the C&O Historical Society. "Steam Echoes of Hamilton" This book, by Ian Wilson, is one of my prime sources of information about the line I model. Highly recommended. 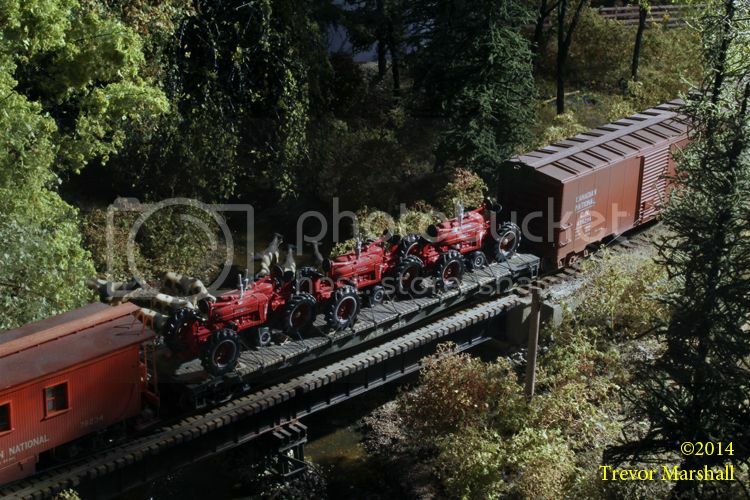 Canadian Freight Cars An excellent resource, with photos, maintained by Ian Cranstone. CNR Historical Association From prototype information to paint, this is an important resource for the serious CNR modeller. Publishers of “CN Lines” magazine, as well as a DVD of back issues. CNR In Ontario Jeffrey Smith maintains a website with invaluable information for anybody interested in modelling the Canadian National Railway in Ontario. Grab a mug or pint, and prepare to spend some time! GPS Video DVDs of Canadian subjects – including Railway Recollections V5, which includes some vintage film of the Port Rowan line. Ian Wilson's "Canadian Branchline" books Invaluable inspiration for anybody interested in the CNR in the steam era in southern Ontario. Lance Mindheim Lance is the go-to person for information on operating modern-era layouts, and has emerged as a leading thinker on simple yet satisfying layout design. Well worth bookmarking. Layout Design SIG Only make new mistakes. Layout Vision The blog written by my friend and one of the most thoughtful layout designers I know, Byron Henderson. 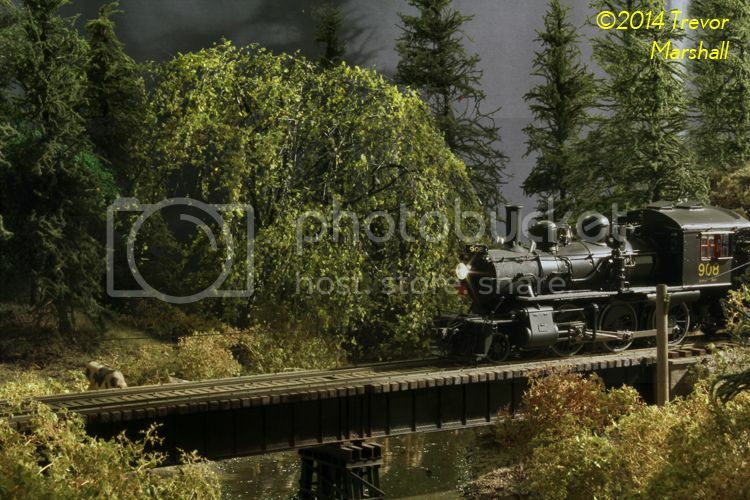 Maine Two-Foot FAQ I’m one of the admins of this blog, which stores and shares a huge amount of information about modelling the two-foot gauge railroads of Maine. NASG – National Association of S Gauguers An invaluable resource for the S scale enthusiast. The product gallery (see separate entry) is a go-to for me. NASG – Product Gallery I know, right? See what I mean? Ontario Branchlines Past and Present (FB) This Facebook group has a lot of great photographs and knowledgeable people. Join up and explore! OST Publications Always insightful musings from my friend Mike Cougill. Also, the place to find “Detailing Track” – a great resource for, well, detailing track! 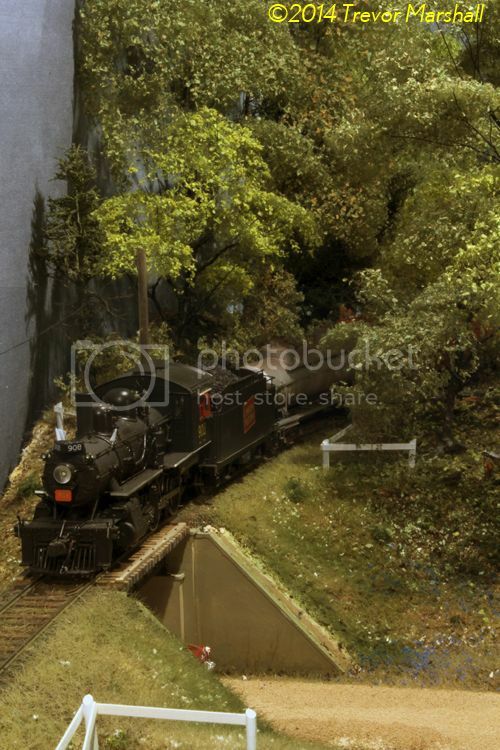 S Scale SIG An NMRA-affiliated group dedicated to scale model railroading in 1:64. Given the dominance of American Flyer-style railroading in this scale, the SIG is a welcome addition to our online community! Steam Era Freight Cars – Blog A blog run by Marty McGuirk which is about exactly what it sounds like: Freight cars from the steam era and how to model them. Some neat information about specific industries, too. Steam Era Freight Cars – Website A tremendous resource for the prototype modeller. Stories and Legends… of Port Rowan (FB) A Facebook group covering Port Rowan, St. Williams, Long Point and area. Join up and explore! Altoona Model Works Some neat S scale craftsman structures – including the water tank I used as the basis for my model. American Models One of the go-to companies for equipment. Arttista My favourite source for S scale people. I wish they would do more! BTS A terrific source for S scale detail parts. Elgin Car Shops My friend Pierre Oliver’s rolling stock-building business, plus a blog about his Southern Pacific layout. 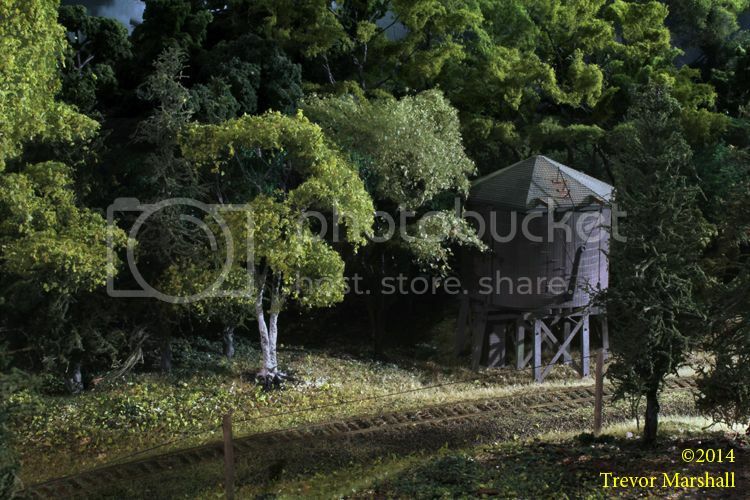 Fast Tracks A great source for tools and supplies for handlaid track – including turnout building fixtures in 1:64. Funaro & Camerlengo While mostly HO, this company does offer a few S scale resin rolling stock kits. Grandt Line An important source for S scale detail castings – from nuts and bolts to doors and windows. Laser-Art Structures by Branchline Trains Mostly serving other scales, this company does do a few nice kits in 1:64. I’ve used a few of their houses on my layout. Lee Valley Tools Super tools, super hardware. There’s a lot of Lee Valley in my layout. MLW Services My friend Andy Malette’s business, supplying neat stuff in S (and sometimes other scales). Mt. Albert Scale Lumber Now owned by Fast Tracks, this company is my go-to for S scale lumber, including ties. Northwest Short Line My rolling stock rolls smoothly and derailment free because of NWSL’s excellent replacement S scale wheel sets. Pacific Rail Shops No longer in business, but an important supplier of rolling stock kits for S scale enthusiast. This link takes you to their story. It’s worth a read – and you may be surprised by how they still influence the hobby today. Proto:87 Stores Don’t let the name fool you: While this company primarily caters to the finescale HO market, Andy Reichert also offers some wicked-good scale spikes for 1:64. Ridgehill Scale Models My friend David Clubine and his late father Oliver run this supplier of resin kits for S scale rolling stock. River Raisin Models Dan Navarre imports some lovely brass models in 1:64. Thanks for that, Dan! S Helper Service At one time, an important supplier of S scale rolling stock. Now owned by MTH, which unfortunately does not give S scale the attention it used to enjoy under Don Thompson. S Scale America Manufacturer of S scale rolling stock and other goodies. Part of the Des Plaines Hobbies store. Scenery Unlimited Actually spelled “S”cenery Unlimited, this company supplies various goodies to the S scale market – including passenger car diaphragms and, at one time, a brass gas electric. 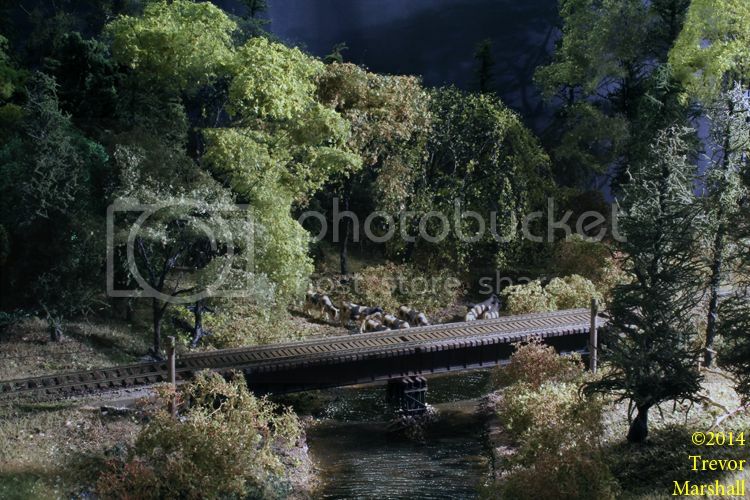 Scenic Express The hobby’s one-stop shop for scenery materials – including many suitable for S scale. Smoky Mountain Model Works Jim King offers a number of resin kits for rolling stock, plus a couple of locomotives and other neat things for the 1:64 enthusiast. Sunset Valley Railroad This supplier of neat stuff for garden railways is the source of the brass switch stands I use to bend the iron on my layout. Tam Valley Depot Nifty electronics for the modeller, including the Frog Juicer for controlling polarity on DCC-equipped layouts. Yarmouth Model Works This manufacturer of high-quality HO scale resin rolling stock kits is entering the S scale market. I’m excited! Algoma Central in HO Chris van der Heide has a nifty blog about modelling this interesting Ontario regional railroad. B&O Old Main Line Jim Fawcett is building a layout based on a neat prototype: The Baltimore and Ohio’s 65-mile Old Main Line from Baltimore to Point of Rocks. He’s modelling a 20-mile stretch of the subdivision and blogging about it here. bobcatt's 2 bits A blog written by my friend Chris Abbott, who frequently helps with the building of my layout. Bogong and Geehi Railway Australian modeller Murray Scholz is building a lovely Australian narrow gauge layout in O scale. 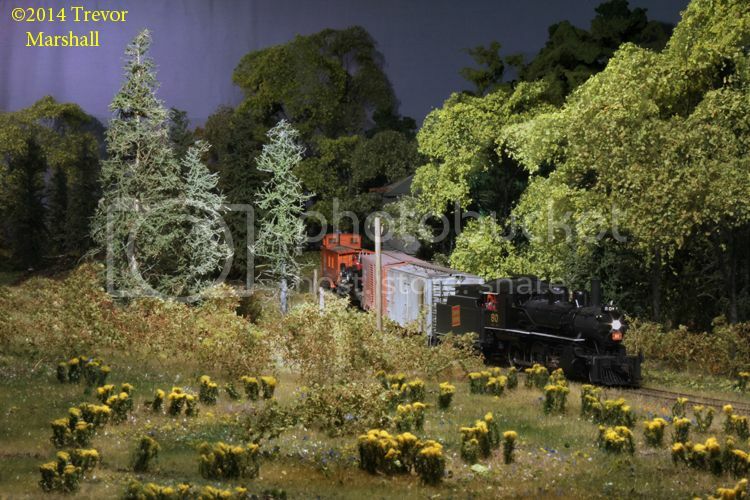 Cardigan Bay Coastal Railroad An On30 layout featuring scenery work by Martin Welberg. Central Vermont Railway An interesting blog by my friend Marty McGuirk about his Central Vermont Railway – and other things. 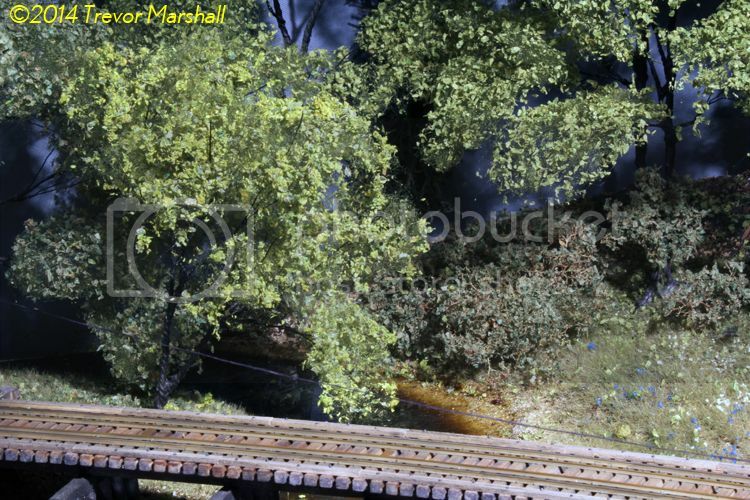 CNR Branchline Modelling in S Scale My friend Andy Malette is building an S scale layout based on Owen Sound, Wiarton, and the junction at Parkhead that connected them – and he’s blogging about it here. CNR Fergus Sub Andreas Keller is building a great, achievable HO scale layout set in the mid-1980s and based on a 14-mile segment of the Canadian National in southern Ontario. 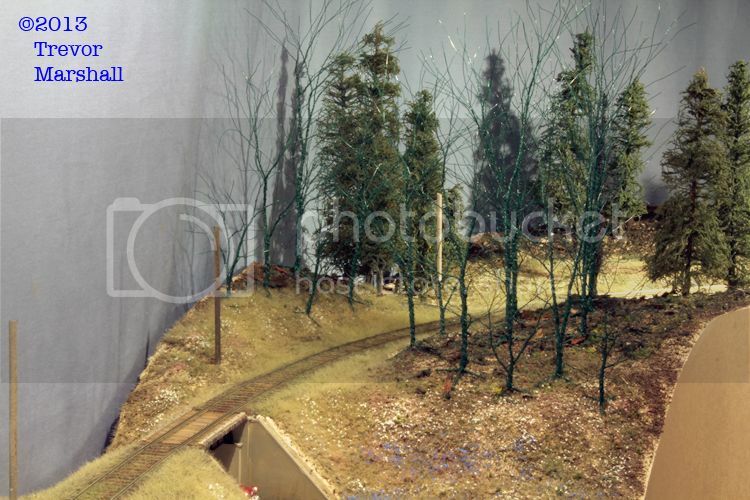 You can read about Andreas’ layout on John Longhurst’s blog. 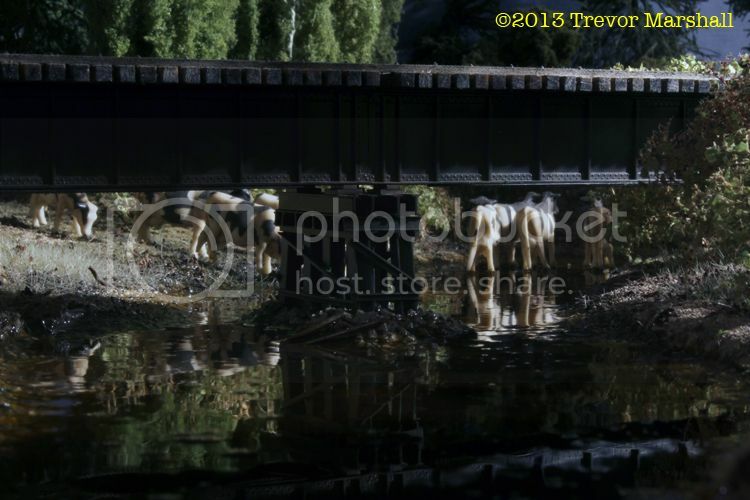 Colorado & Southern in Sn3 Darel Leedy’s blog documents his rendition of this iconic narrow gauge line in 1:64. 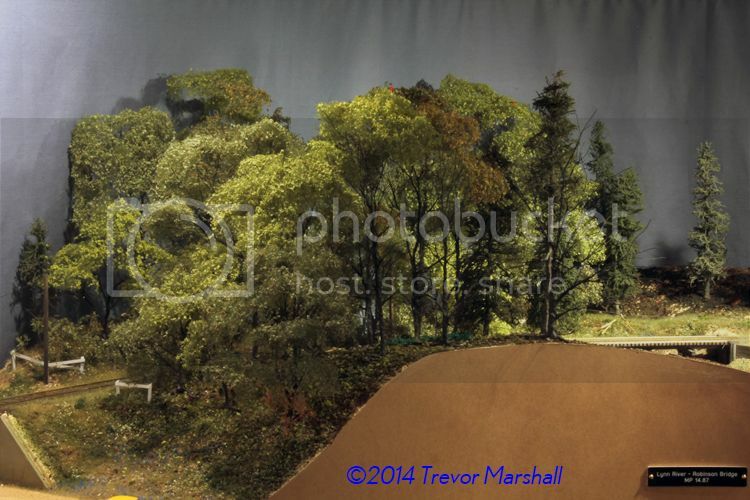 CP Rail Manitoba and Minnesota Division John Longhurst blogs about his HO scale layout, and other neat stuff. He’s even interviewed Jim Martin and me about The Model Railway Show. Dawson Station Kenneth Olson’s N scale switching layout is tiny, but his ideas are really interesting. I especially like how he’s taken the layout to Maker Faires. 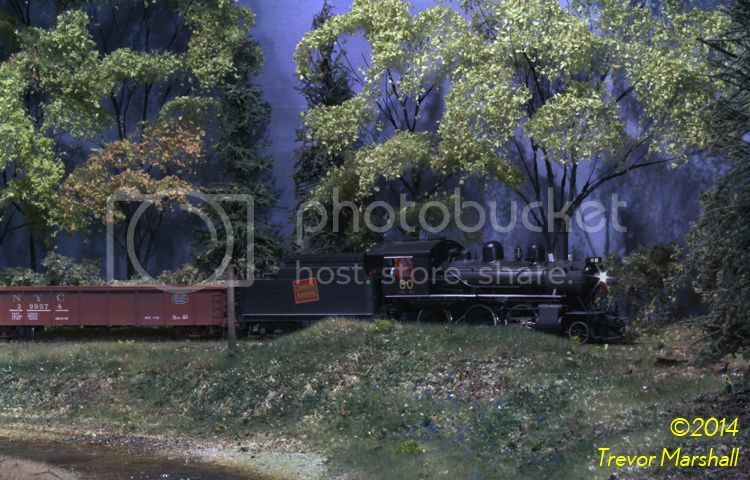 Delaware Lackawana RR in Proto:48 A blog written by my friend Jim Lincoln about his Proto:48 modelling. Designing, Building, Operating Eric Hansmann’s blog is full of neat ideas as he builds an achievable layout focused on a freight terminal and team track yard. Eastport Branch Ben Brown was building a Maine Central branch in Proto:48. Unfortunately, he passed away before he could finish it, but (for now) his layout lives on, online. Elgin Car Shops blog My friend Pierre Oliver regularly updates his blog with information on rolling stock he’s building for customers, the HO scale rolling stock in his own line of kits, and – most importantly – his Southern Pacific layout. Erie Railroad Harlem Station A classic New York City “pocket terminal” in HO scale. Erratic and Wandering Journey An interesting blog by fellow S scale enthusiast Simon Dunkley. Fillmore Avenue Roundhouse My friend Rick De Candido has built a terrific layout based on an unusual theme: a New York Central engine service terminal in Buffalo. 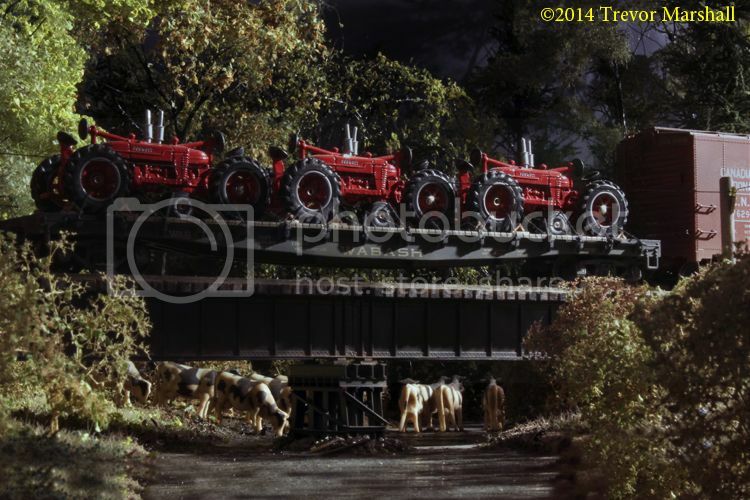 This was featured in the 2015 edition of Model Railroad Planning magazine. G&W Quebec Gatineau Railway My friend Bernard Hellen is building an HO scale layout based on a modern-day short line in Quebec. He blogs about it here. Grimstad Line An interesting blog by Tore Hjellest, who lives in Norway and models a Norwegian branch line, circa 1965. Hopedale & Barre RR My friend Chester Louis does great work in Proto:48. Here’s his blog. Industrial Lead Seattle-area hobbyist Greg Amer blogs about his modern-era HO scale switching layout, based on the prototype industries he works as a BNSF locomotive engineer. 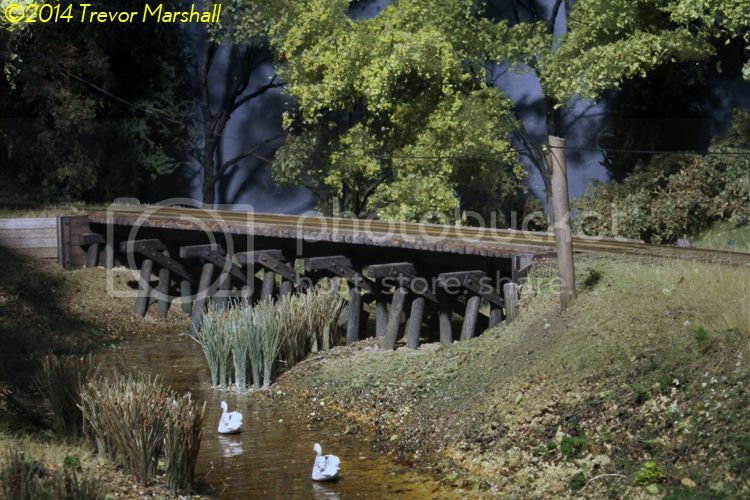 Inverness and Richmond Railway Drew Bunn is building a proto-lanced version of the CNR’s Inverness Sub in N scale. Iowa Interstate – Milan branch Scott Thornton is building a lovely HO scale rendition of a branch of the Iowa Interstate Railroad. It’s exactly the sort of layout I advocate on my Achievable Layouts blog. Iowa Interstate Grimes Line James McNab is building a delightful, prototype-based, modern-era short line operation in HO scale – exactly the sort of subject I advocate on my Achievable Layouts blog. Here’s a link to his blog at Model Railroad Hobbyist. Louisiana Central Jack Shall’s HO scale railroad, linking the Texas and Pacific with the Mississippi Central through the Tunica Hills. Metaline Falls Terminal Railroad Matt Forcum’s blog documents his work on a very nicely done modern layout set in Washington State. 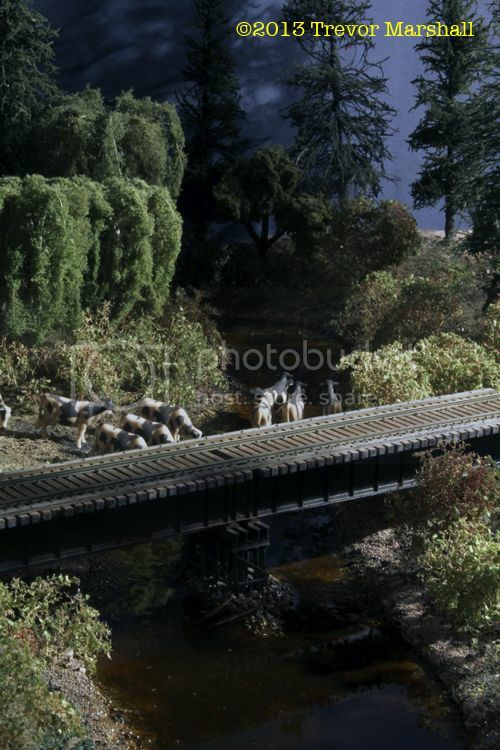 Midland Railway On his blog, Steve Lucas describes how he’s modelling a Canadian independent railway in October, 1956, based around the operations in Lindsay, Ontario. Model Meander, A My friend Mark Zagrodney is working on a Proto:48 layout and blogs about it here. Model Railroad Imagineerings My friend Herbert “Matt” Matthews has an interesting blog about the hobby. 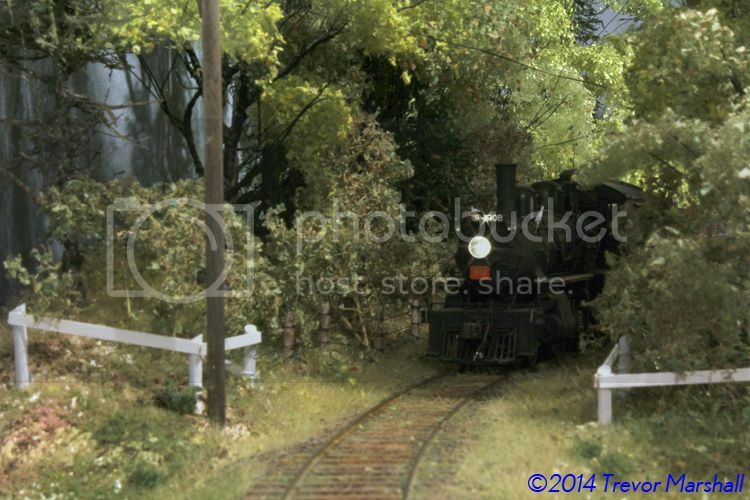 Modeling Maine in Narrow Gauge George Dutka’s blog about his adventures in Maine two-foot modelling, in On30. Modeling the NYO&W Bill Schneider (“Old Woman in The Back Bedroom”) has a blog about modeling the New York Ontario & Western. This layout was scrapped in 2013. Modeling the SP The always thoughtful blog by freight car historian and Signature Press publisher Tony Thompson. 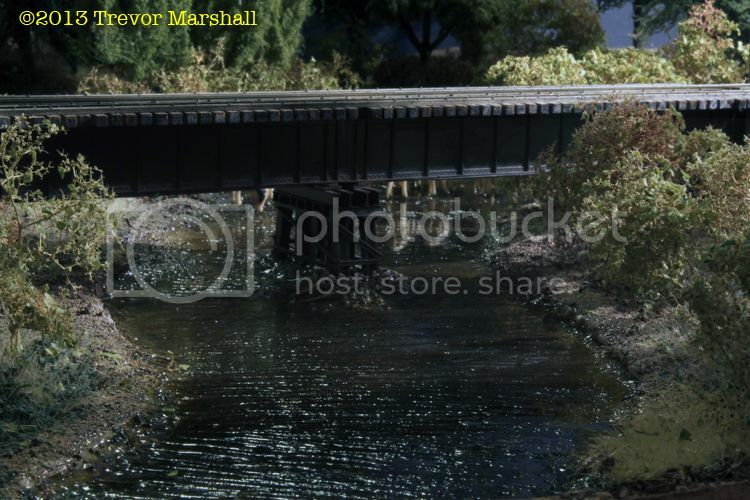 Morpeth in O scale Trevor Hodges is a great modeller in Australia, working in 7mm scale. There are many ideas on his blog that are useful regardless of scale, gauge, or part of the world one models. MrDan's Model Musings Dan DI’Uo’s blog on his model and prototype interests. Musings On My Model Railroading Addiction My friend Stephen J Gardiner blogs about his rail fanning, railway museum work, and model building. 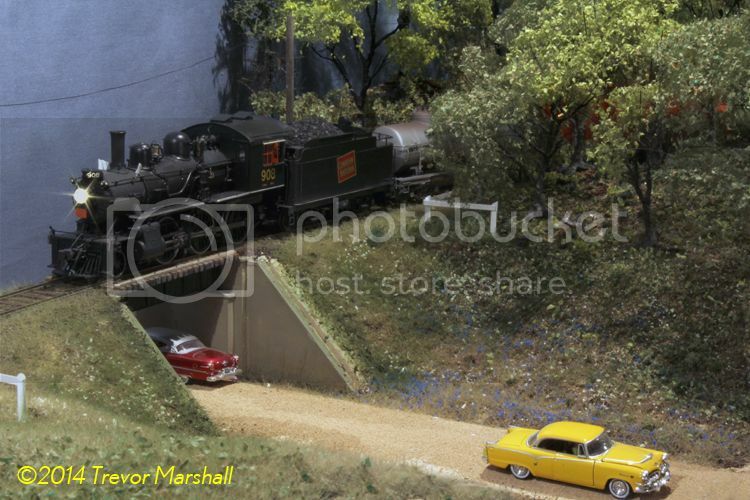 New Castle Industrial Railroad Real railroad conductor Jack Hill writes about his O scale modern switching layout. Lots to learn on this blog, but unfortunately it has been dormant for quite some time. 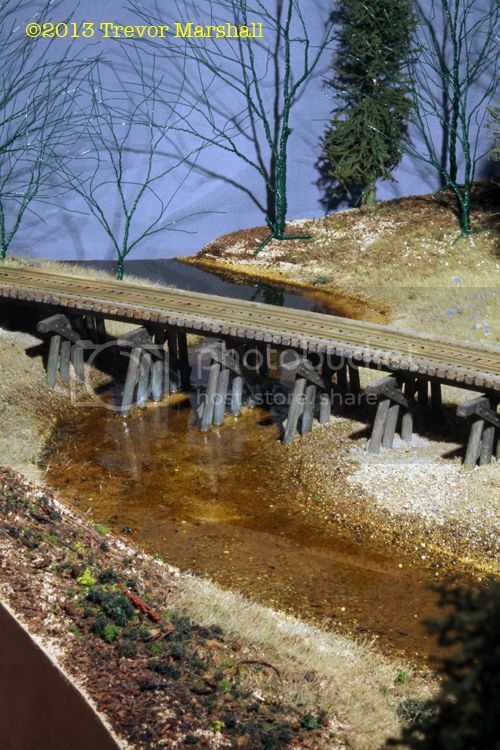 Niagara Branch Hunter Hughson blogs about his home layout – Penn Central’s connection to Canada in HO scale. No Two Alike Interesting blog by A R Pollard, a UK modeller whose prototype of choice is a classic North American interurban. 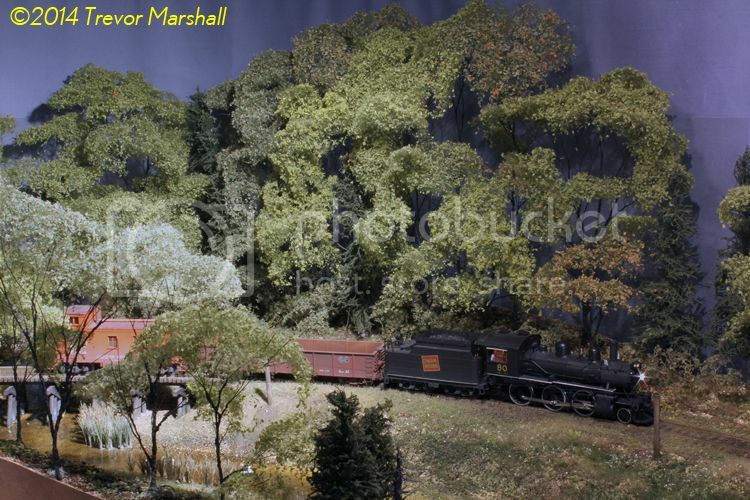 Northeast Kingdom Mike McNamara’s blog on his HO layout set in the St. Johnsbury VT area. Ontario in HO Scale Hunter Hughson blogs about his involvement in the hobby – mostly expressed through his activities with the remarkable Waterloo Regional Model Railroad Club. Pajaro Valley Consolidated Railroad Nick Lisica is modelling a California short line sugar railroad in N scale. His work is wonderful – check it out. Peter's Vanvliet's Model Railroading Peter Vanvliet has built a number of layouts. His site is well worth exploring. Prince Street Terminal The always thoughtful Chris Mears on his model railway projects, and the prototypes that inspire him. Prototype Railroad Topics Ted Culotta is an excellent prototype researcher and modeller, and writes this thought-provoking blog. Quebec South Shore Railway My friend Matthieu Lachance has a blog about modelling a great subject for a model railway – a Canadian branch line facing abandonment in the 1980s. Railroad Prototype Modeler by John Golden John organizes the St. Louis RPM. He also writes this nifty blog about his interests in the hobby. Signal Station 199 My friend Joe Smith is building a beautiful rendition of the New Haven in and around Danbury. Very inspiring modelling! Sn2 Modeler My friend David Keith’s blog about his S scale layout, depicting the two-foot gauge Sandy River and Rangeley Lakes circa 1912. South Paris Switcher My friend Ryan Mendell is planning a new layout based on the Grand Trunk Railway in Maine. Here’s his blog. 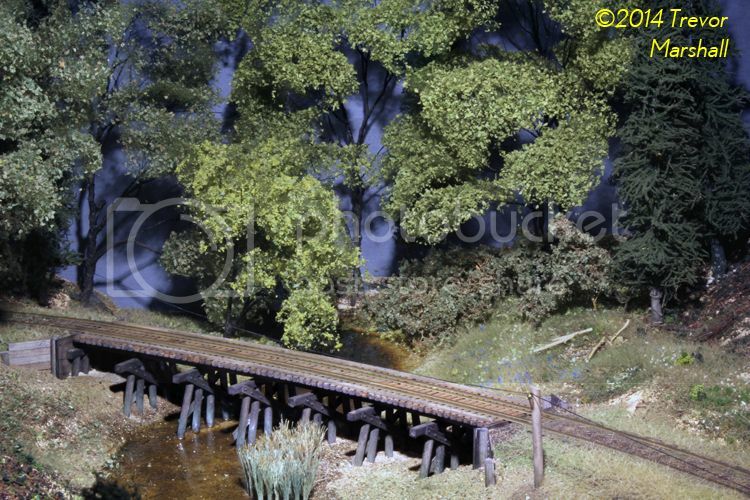 Station Studios Barry Cott’s railway pages – covering a variety of scales, gauges and themes. Stockton & Copperopolis Railroad How can you not love a name like that? 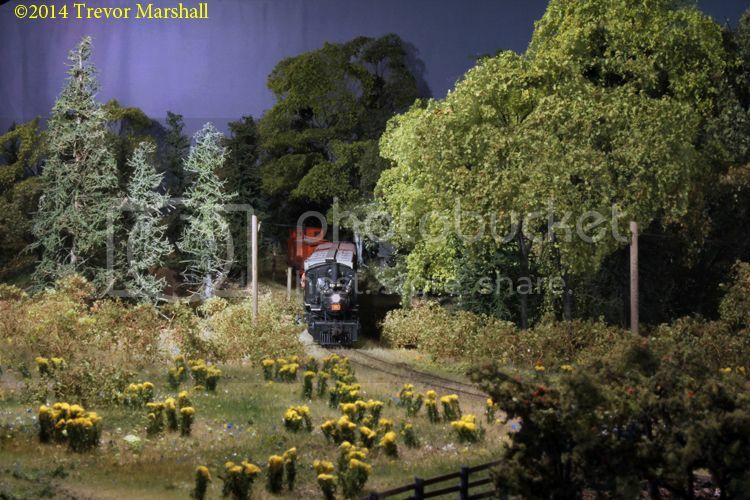 Don Ball blogs about his HO layout, set in the Central Valley and foothills of California in 1895. 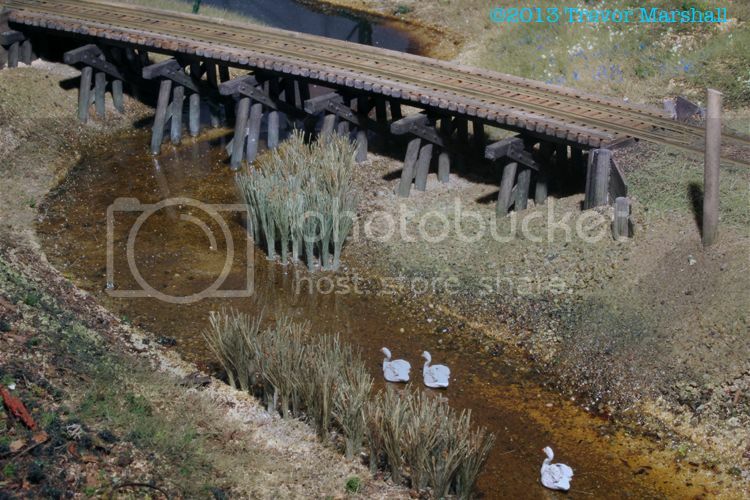 Temiscouata Railway in S My friend Matthieu Lachance has started a blog on a great subject for a model railway – one of my favourite prototypes, too! 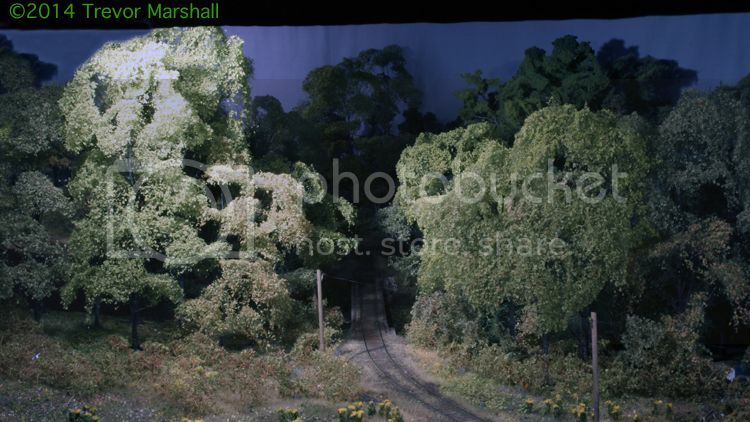 The Valley Local Chris Adams is building a really neat HO scale layout based on the New Haven’s Connecticut Valley Line, and blogging about it here. 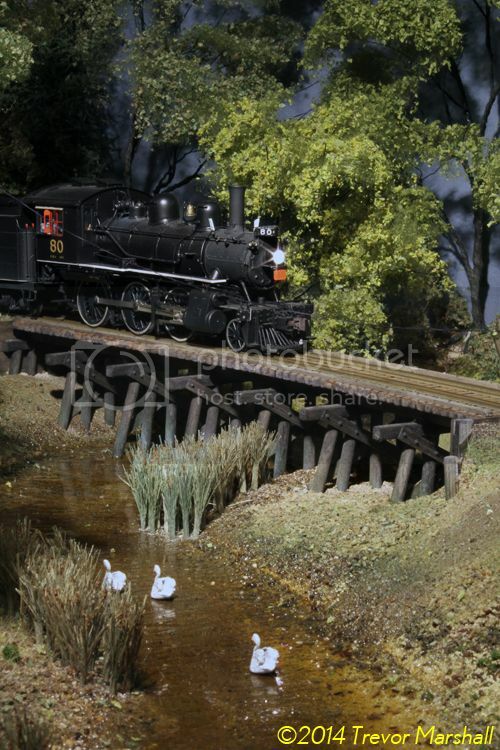 Topdown & Drywater Vera Sepulveda’s blog about various adventures in model railroading. Tuscarora Railroad Kevin Strong wrote about his 1:20.3 scale garden railroad in a series for Garden Railways magazine. 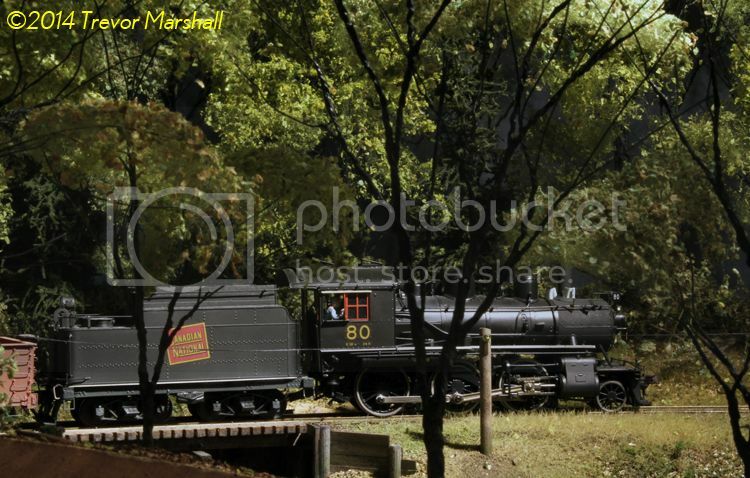 Here’s his blog about his Tuscarora Railroad. 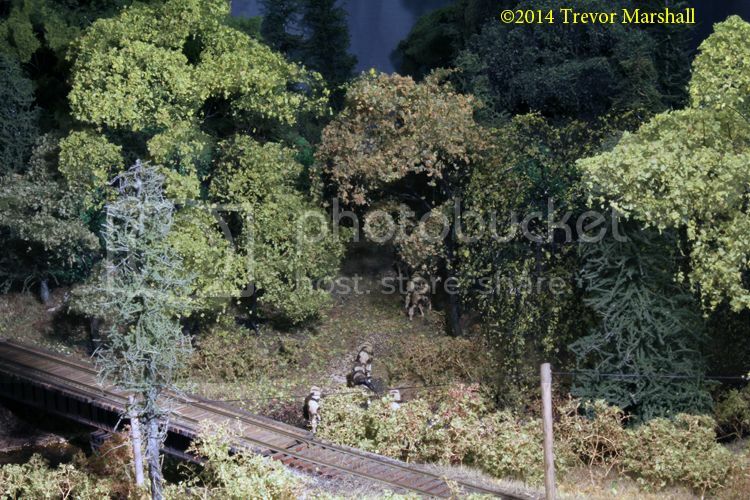 US Military Railroad – 1863 Bernie Kempinski’s blog about his wonderful 1:48 Civil War era military railroad and other goings on. Waterloo Region Model Railway Club At the opposite end of the spectrum from the layout I’m building, this group is constructing a massive layout that accurately models the CP Rail Sudbury Division in the 1970s. This club is southern Ontario’s answer to La Mesa and the NEB&W. 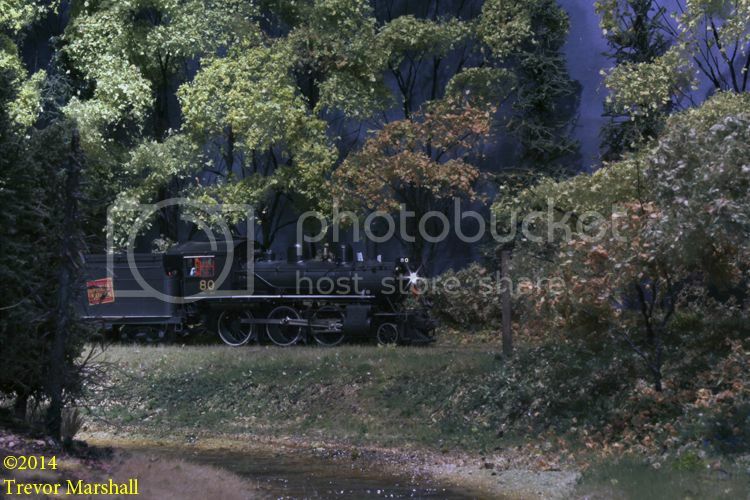 White River Division George Dutka’s blog about his beautiful New England layout – and other things. Big Fat Burrito Quick and filling lunches in Kensington Market. Cook's Illustrated When friends gather for a work session or operating night, a good meal goes a long way towards making it memorable. But what if you’re puzzled by pans? Cook’s Illustrated is the geek’s answer to great cooking – check it out! Harbord House My local pub. My second home. Harvest Kitchen Great food and a fun room. Her Father's Cider Bar + Kitchen Yes – a cider bar! The Caledonian A terrific Scottish pub: fine food and a dram.